Welcome to Dr. Leila Ahmadi's Optometry office, where we are committed to bringing you the highest level of total eye care. We strive to provide you and your family with detailed one on one attention. Our office offers patients the newest technology and equipment with a professional team of experienced staff committed to you. At our office, we offer thorough eye examinations for all ages from children to adults and seniors. 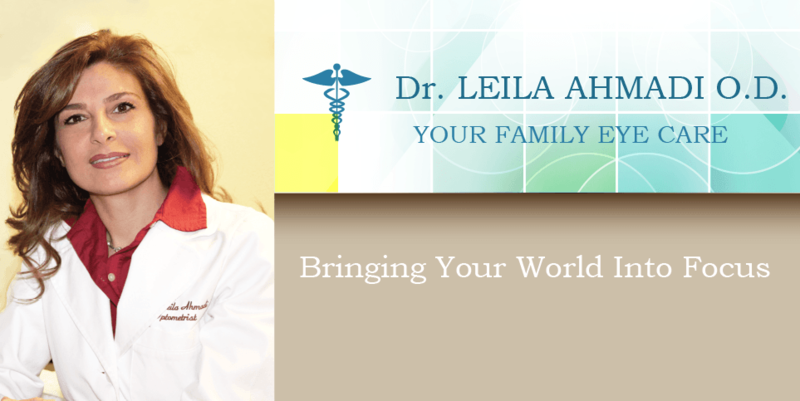 Dr. Leila Ahmadi knows that preventative care is an important part of your eye health. Often times eye problems and diseases do not manifest noticeable signs or symptoms until they have progressed into a serious condition. Early prevention and detection of illness is a key factor in maintaining your eye health. Our friendly and competent staff can help you in selecting eye wear that is right for you. Our contemporary optical boutique provides quality eye wear with fashion and flair. We offer high quality lenses, frames and sunglasses in a wide variety of styles and designer name brands to meet each patient's unique needs. We also offer you a complete line of contact lenses and services.